Includes boy and girl centerpiece, 7 letters that spell "Welcome," dog, cat, and a book bag, stack of books, and 24 pencils. Resource guide included. Printed 2 sides. 18" x 25". 16" printed 2 sides, 4 per pack. 12, 3 foot x 3 inch strips for a total of 36 feet. 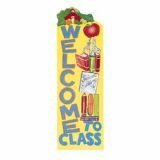 Includes class rules, class monitors, and class schedule banners along with a welcome sign, and 12 other rain forest decorative pieces. 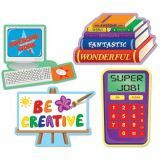 Perfect for back-to-school displays! Die-cut banners extend to large 111/2" to 44" dimension. 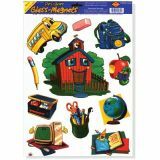 This die-cut banner extend to large 11 1/2" to 44" dimension. Sail into a rollicking classroom adventure! 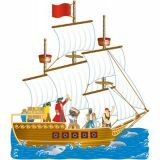 Features a 21 1/4" x 7 1/4" banner, a 32 1/4" x 36 3/4"" pirate ship, and three each of 11 themed accent pieces. Includes a four-page teacher guide with reproducibles. 37 pieces. 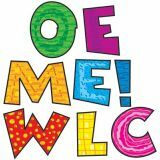 Includes 7 letters that spell out WELCOME, ranging from approximately 8" x 13" to 18" x 13", one exclamation point, and resource guide. 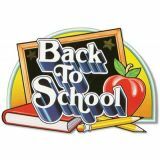 Give students a big welcome from the Carson-Dellosa kids! 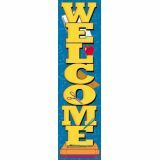 Includes a 5-piece, easy-to-assemble 73" x 211/2" Welcome display.